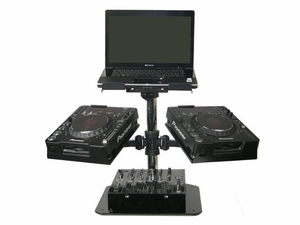 Elevate your laptop and pro audio gear in style with our new heavy-duty L-EVATION stands. 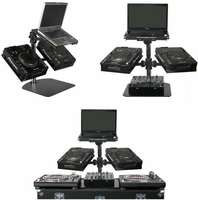 The L2CDJUNI version has two LCDJPLATE's to hold a two Pioneer CDJ-1000 players and one L-Evation Universal plate (LUNIPLATE) with adjustable depth support for your laptops, most other tabletop CD players, effects units, and other pro gear. Easy to assemble and customize with its adjustable height and strong robotic-like support arm. Have it set-up over your turntable, mixer, and other gears, giving you that extra cutting edge in your mixes with easy access to your mounted gear. � Pole plus base height:17"
� Top plate with extension & pole depth: 22"
� Expandable depth from 14.5" to 17.5"
� Includes four wing nuts and a universal wrench. � Each arm extends 10.5"
� Overall width is 26.5"
� Adaptor diameter is 2"
� Over all pole height is 20.5"